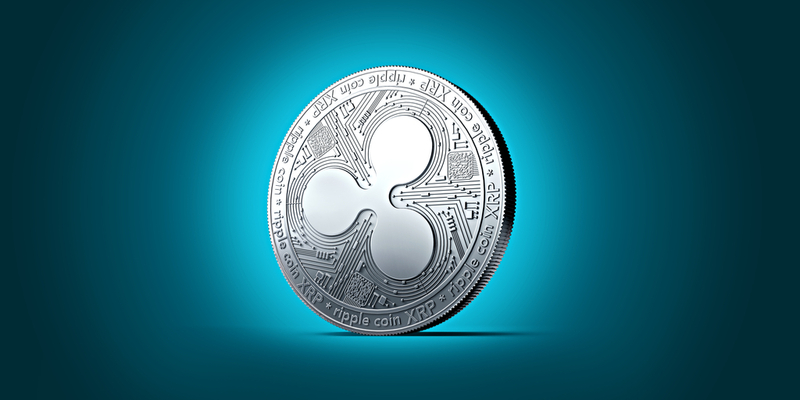 Today we promise to review a method for tackling the Ripple vs US Dollar pair in detail which discusses the tools, instruments and trade plan ideas. 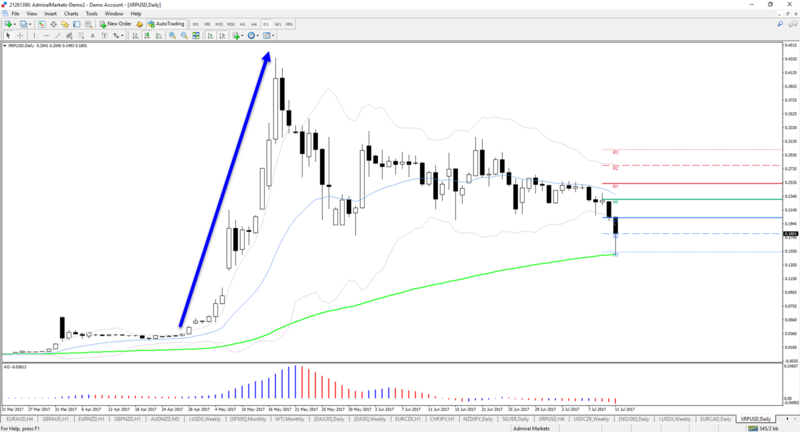 Our article will explore various aspects of trading the XRP/USD crypto pair, applying technical analysis aspects like trend, momentum, support and resistance, and showing how to day trade the pair on MetaTrader 4. The Ripple cryptocurrency showed massive bullish momentum (blue arrow below) in April and May of 2017, but price action has been falling ever since the big spike to 0.4331. Big momentum up and now big momentum down, the Ripple versus US Dollar pair (XRP/USD) is certainly moving with speed and impulsiveness. Considering the presence of such strong volatility on the XRP/USD CFD, long positions are considered to be a safer trade direction, which is why Admiral Markets currently offers long trades only. The quick price action up and down, however, does not mean a trend is visible or available. It's time to discuss the trend as well. An established trend has not proven itself yet despite the strong momentum up and down because price is not offering a clear trend channel. Another factor is that the historical data range is also still short (3-4 months only). Not much historical data is available at the moment when compared to Forex or CFD charts. We therefore consider the XRP/USD to be in a range without an established trend. The quick price action however does offer trading opportunities, which is what we will discuss in the next part. How to Trade Ripple CFDs? Support and Resistance (S&R) is always a keep component when applying technical analysis to the price chart. The S&R concept becomes even more important when the pair is ranging rather than trending, which is how XRP/USD is behaving at the moment (see above). The volatility of price action is high. There is limited historical data. 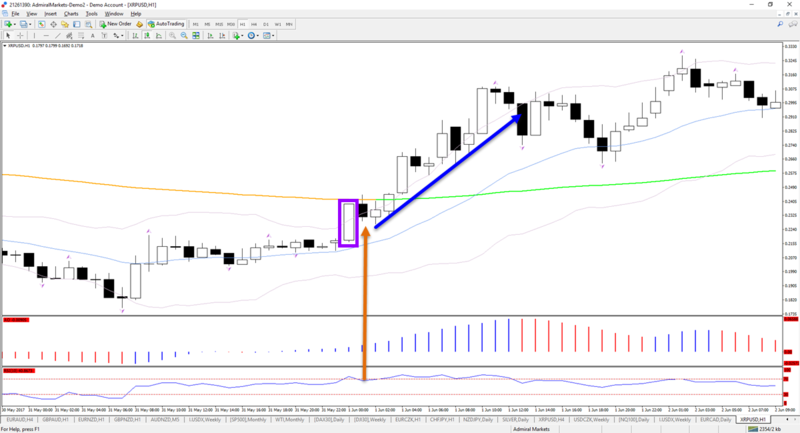 The dynamic indicator of our choice is the Admiral Keltner band, which is part of the MetaTrader 4 Supreme Edition. It offers consistent support and resistance levels and is automatically updated with every new candle. The indicator also provides key break and bounce levels. Another important factor remains candlestick patterns, which provide guidance about the price direction and whether price is breaking, bouncing or failing to break or bounce. These concepts will be explained in more detail in the next part which discusses strategies for trading XRP/USD. Which Strategy Should You Use to Trade Ripple CFDs? Our main tactic is to trade bounce trades at support levels whereas breakout trades above resistance receives our second preference. We will review both ideas on four-hour charts. The initial reaction to the support level: a candlestick pattern which is confirming the bullish bounce at Admiral Keltner (the blue box in image above). The second reaction after the bounce: price bounces, then pullbacks to the support level, fails to continue lower and bounces up again (purple box in image above). For the candlestick pattern reactions at support, we refer to the price action trading school that reviews this aspect and more. For the pullback to the support level, it is important to add the Fractal indicator. Once a fractal is visible and confirmed near the Keltner support, there is a decent chance of a continuation higher and an entry could made on the break of the candle high for instance (the green lines in image above). More information on how we trade these setups, including stop loss and take profits are available via our daily live webinars. A strong candle closes near the high tend to indicate a strong breakout → ok to trade. A weak candle closes with the wick at the top tend to indicate a weak breakout → avoid trading. An oscillator, like the MACD or the Awesome Oscillator, used to avoid trading breakouts when divergence is present. 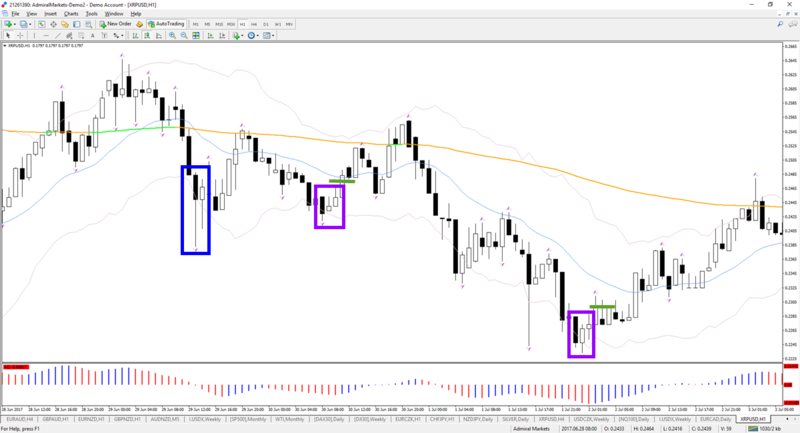 The image below shows an example of a bullish breakout (the purple box) with a candle close near the high. A small retracement does occur as the RSI goes to an extreme (the orange arrow), but the bullish momentum continues as the price stays above the resistance of the Keltner indicator (the blue arrow). The above information is not enough to trade the above mentioned concepts, which is why we invite you to join our daily live webinars, where we analyse and trade these setups. Trading in a lower time frame always requires more practise and experience than when trading higher time frames. Yes, there are more trading opportunities when trading the 15 minute chart, but there is also more 'noise' and traders need to be more critical with the setups they choose. When trading based on technical analysis, you always want to check if there is a potential news event or data release that could create spontaneous and quick price spikes. Basically we are cautious during these times and prefer to trade normal trends rather than sudden price spikes. Technical traders especially want to trade technically and avoid price movements that are based on one time events. Price must be above this MA before I would trade any of the intra-day setups. If price is below the MA then I will skip any intra-day long setups. The trend line is a dynamic tool which traders need to draw on the chart themselves. The Pivot Points are automatically added static S&R levels. A push above the trend line or PP is a breakout setup. A reversal at the trend line or PP is a bounce setup. Of course, this is just one rough idea how to tackle intra-day trading. There are many different types of trading methods that could be used to tackle the markets. 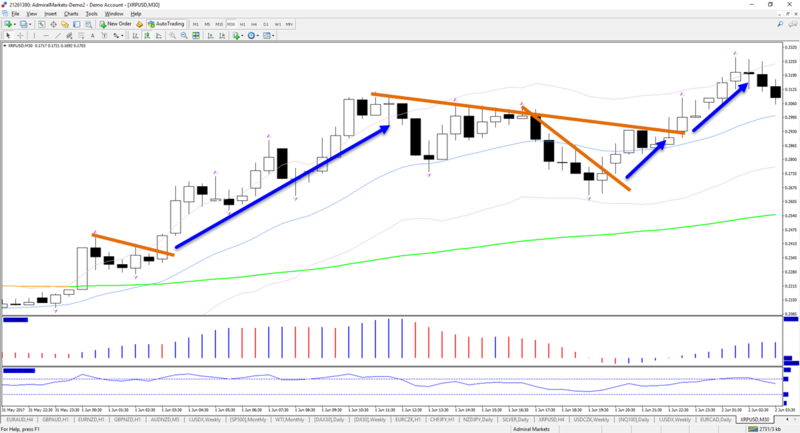 For more information we invite to our daily live webinars where we analyse and trade these setups. Yes, it is possible to earn money from trading XRP/USD but it is always important to realise the trading involves risk, which means that money can be lost too. There are a couple of key elements you should always take into account when trying to earn money when trading the markets. it is important to keep in mind that trading requires patience and discipline. This is part of "trading psychology" and it is an important aspect to remain balanced in your mind when tackling the markets. Otherwise it could be tempting to revenge trade, over trade, over analyse and/or suffer many other pitfalls that trap traders into losing habit and false biases. The other key aspect is risk management. When traders risk too much, this will turn into gambling and the chance of losing the entire trading capital and perhaps more increases strongly in the long run. To avoid losing the entire trading capital (and one's mental capital as well), each trade needs to be split into small quantities of the capital, such as 0.5%, 1%, or 2%. A streak of losses (drawdown) will usually not lead to a significant depletion of the account and allow traders to keep trading another day. Last but not least, traders need to approach the markets with a sturdy trading plan that indicates how to analyse the charts, how to enter the trade, manage the setups and exit the trade. Each trader will have their own trading style and prefer different types of tools and indicators. This is why it is important to test your trading plan first with a demo or small risk on a real account. Enthusiasm for Ripple was of course high when it set a new high versus the US Dollar on 17 May, 2017. Price action made a huge spike but the momentum was a burst of energy that was unsustainable in the long run. Price needed to make a correction, as markets also eventually do. The spike on the XRP/USD chart reminds us of the Silver (XAG/USD) spike on the monthly chart back in 2010-2013. The pattern for Ripple, however, was on a much smaller scale than Silver. Ultimately there is a decent probability that price will respect technical analysis and key levels just like any other chart. Overall, the Ripple versus US Dollar chart seems to be more of a range pair than a trending chart. This could be a cryptocurrency pair that is especially suited for traders that like to trade momentum within a larger moment, at least for the upcoming year. Besides trading Ripple versus the US Dollar (XRP/USD), Admiral Markets traders can also trade Bitcoin versus the US Dollar (BTC/USD), Ethereum versus US Dollar (ETH/USD), and Litecoin versus US Dollar (LTC/USD). Traders need to download the software platform (MetaTrader 4), which allows traders to access the market and/or watch price action on their chart. The process is very quick and simple and you will be ready to go in no-time. Yes, it is possible to trade cryptocurrencies via Admiral Markets including Ripple versus the US Dollar (XRP/USD). 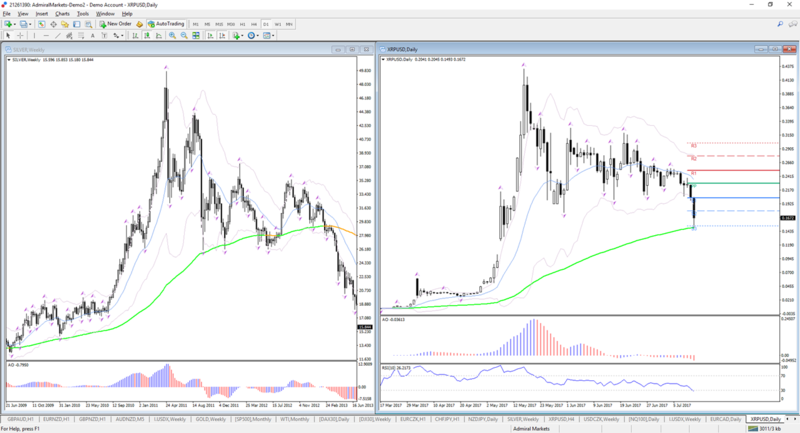 Traders can access XRP/USD and other crypto pairs via both the MetaTrader 4 and MetaTrader 4 Supreme Edition platform. Of course, besides cryptocurrencies, Admiral Markets is a broker with a wide choice of instruments, including currency pairs, CFD's and commodities. With live daily analysis, webinars, articles and the extra added tools and expertise, it's time to discover Admiral Markets and make it your trading hub!